You recognize the name "Sadekar," right? Golf Babes' friend Nisha Sadekar has been featured here before. Seema is Nisha's little sister ("hot" must run in that family). Seema has been playing collegiately at the University of Nevada-Las Vegas and just recently turned professional. Seema was an all-conference selection last year and team captain and MVP this year. She'll be playing on the Canadian Women's Tour over the balance of 2007, but she has also joined her sister's company Play Golf Designs in Las Vegas. That means if your company is meeting in Las Vegas - or even if you're just heading to Vegas on your own - you can play golf with Seema. Pretty good reason to visit Vegas, eh? 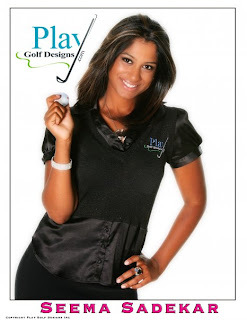 You can visit the Play Golf Designs Web site for more info about the company's services. And keep an eye on that site, by the way. Nisha is in the process of getting a new site up and running. I've seen the new version and in addition to being an eye-catching site in its own right, it also features plenty of great new photos of the PGD staff professionals.